I can honestly say that for the most part I don’t miss grains in my diet. Bread, pasta and rice are bland carriers for flavorful toppings or fillings, and since I’m for the most part substituting grains with vegetables and healthy fat, I feel that I’m doing better nutritionally by eliminating grains from my diet. 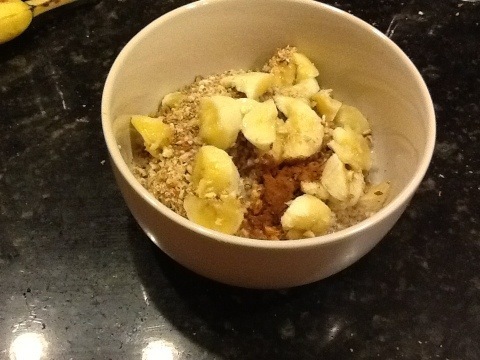 That being said, oatmeal is one of the two grain-based products that I miss. (10 points to whoever comments with the correct answer first. The first local person to guess correctly wins a nutritious homemade prize.) I was happy with the Oatless Oatmeal that I tried last month, but it requires 3 eggs. 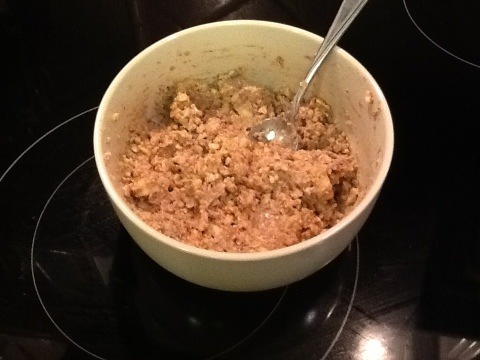 I was excited to try this recipe for Paleo Hot Cereal because it is egg-free. It’s not that I have anything against eggs, it’s just that our family goes through about 2 dozen eggs a week, so it’s nice to have an egg-free alternative for when we run out! 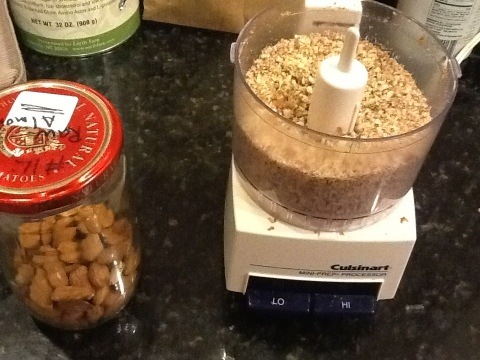 Pulse the nuts in a food processor or blender until desired consistency – the hot cereal can be smooth or chunky. Add remaining ingredients and warm in the microwave or on the stove until hot. After I got to this step I realized that the original recipe called for putting all the ingredients in the food processor. I liked having some chunks of banana in the cereal, so next time I’ll pulse the spices in with the nuts, but I will add the banana later. Add fresh berries and more almond or coconut milk to taste if desired. Ok, I know this looks like raw ground pork in the picture, but it really was yummy! I divided this into 2 servings since even with the lower calorie unsweetened almond milk, the entire recipe tops 700 calories. (be careful, Paleo can make you fat! I added 2T of whey protein powder to my portion. Tom ate his plain. We both thought it was very good. I keep bananas in the freezer to make these recipes in case I don’t have any fresh. P.S. If this really doesn’t look like something you would eat, never fear, this is not the homemade prize. I would think that you miss the barley hops, is there any other grain? Barley is correct, and by mentioning hops I know you mean beer! Congratulations! Your prize is delicious homemade chicken broth.